Sarah and Daniel’s Family, the Second Family! 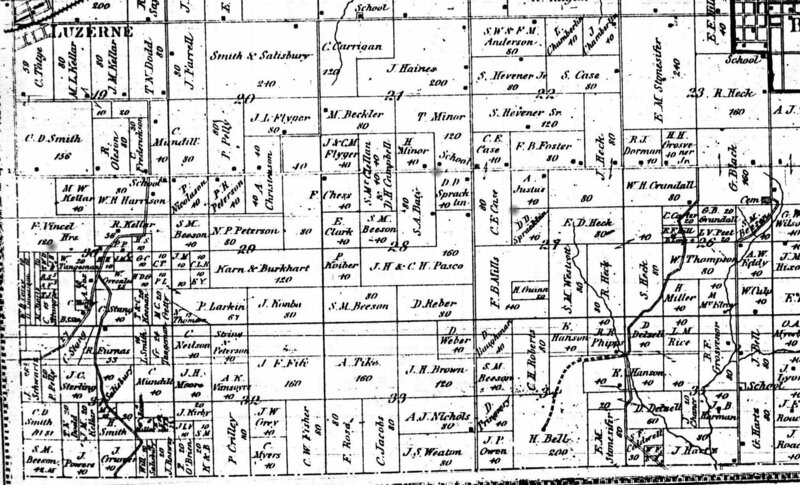 Daniel D. Spracklin married Sarah Blacketer Allgood on 21 November 1863 in Marengo, Iowa Co., Iowa. 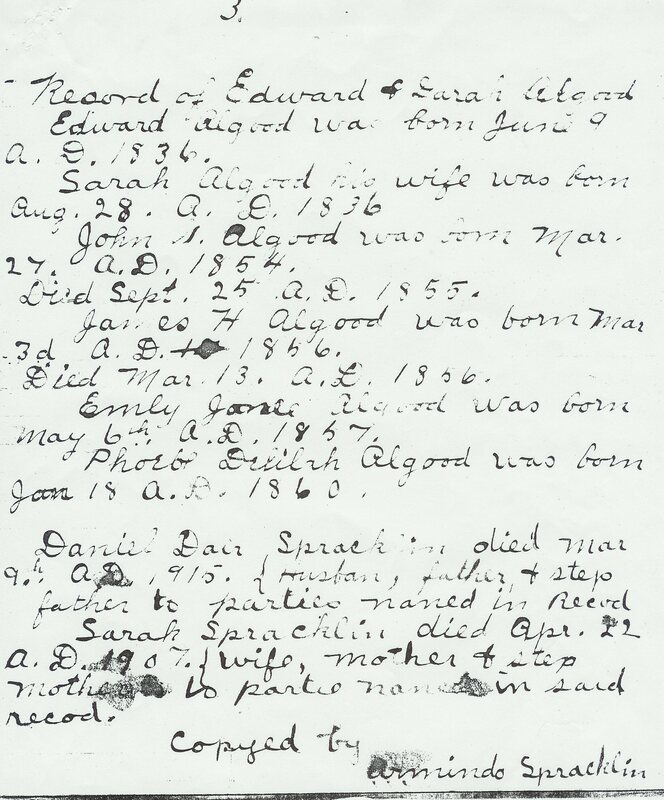 Source: Marriage Record of Daniel and Sara Spracklin Vol. C 1863-1874, Microfilm at the Iowa Genealogical Society, Des Moines, Iowa. 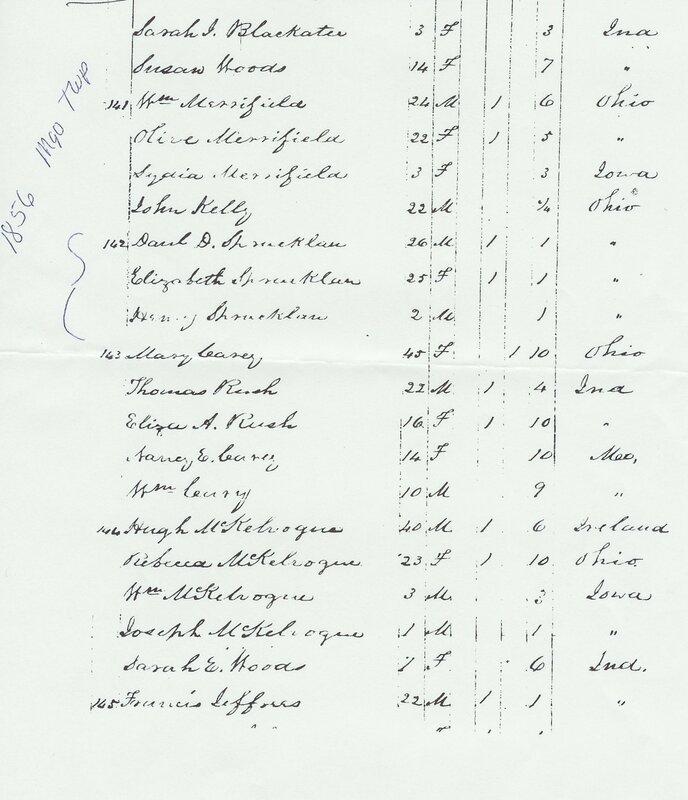 Marriage Record, November 21, 1863. D.D. 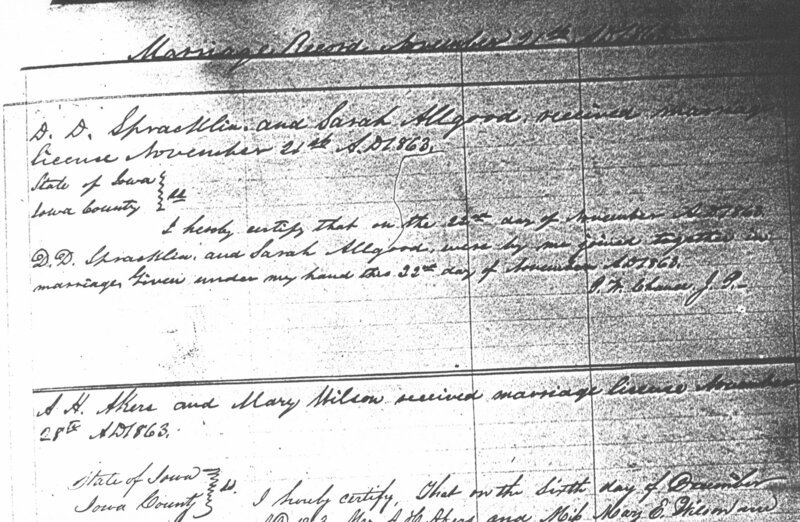 Spracklin and Sarah Allgood received marriage license November 21, 1863, State of Iowa, Iowa County. I herby certify that on the 22nd day of November 1863. D.D. Spracklin and Sarah Allgood were by me joined together in marriage. Given under my hand the 22nd date of November 1863, D.W. Chance J.P.
Photo: L to R: Reed A. Spracklin, Daniel Goss Spracklin, Charles Edward Spracklin, Virda Huston Spracklin, Peter George Spracklin, Lydia Marie Spracklin, Daniel Goss Spracklin Reed Andrews Spracklin. There seems to be a little disagreement in the family as to which one is Daniel and which one is Reed. Based on other photos I think that the update is correct (11/2014). I think they look cold. I would say this was taken about 1908 or maybe 1915??? 1. Lydia Marie Spracklin was born 12 July 1864, Benton County, Iowa and died the 27th of May 1930 in Somers, Calhoun Co., Iowa. She married Thomas Jefferson Ross on 9 Sept. 1881 in Dayton Twp., Iowa Co., Iowa. 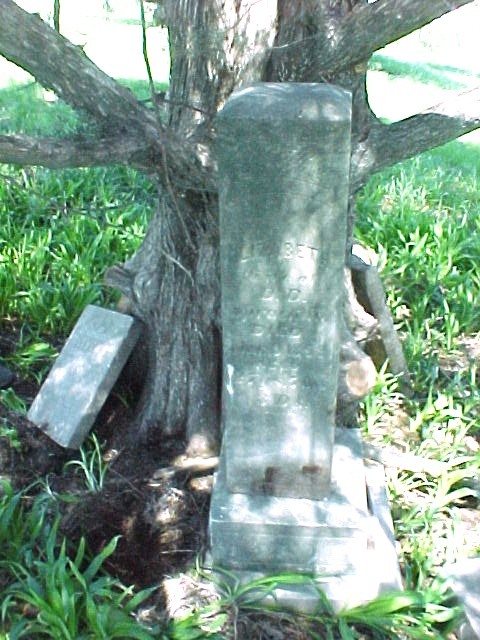 They are both buried in the Cedar Cemetery, Rinard, Calhoun County, Iowa. 2. Virda Huston Spracklin was born 11 June 1866 in Benton County, Iowa and died 15 November 1927 in Woonsocket, Sanborn County, South Dakota. He married Lillie Mae Amsden on 12 November 1889 in Rockwell City, Calhoun Co., Iowa. They ar both buried in the Eventide Cemetery in Woonsocket. I was very excited to see that FindAGrave has a picture of Virda’s tombstone. I have tried to figure out how I could visit. 3. Reed Andrews Spracklin born 24 August 1868, Benton Co., Iowa and died 18 July 1938 in Jordan, Garfield Co., Montana. 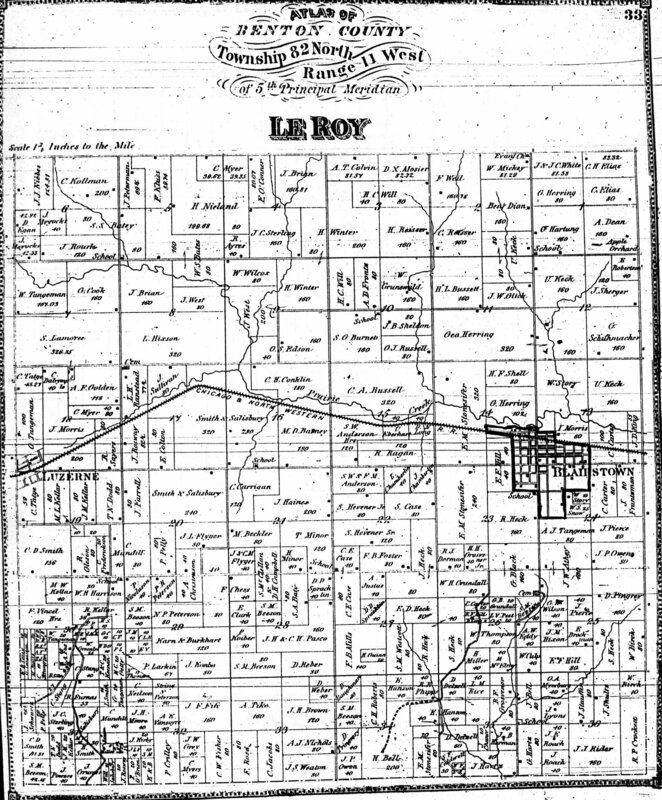 He married Julia Ann Siler on the 29th of December 1897 in Greenfield Twp., Calhoun Co., Iowa. They are buried in the Pioneer Cemetery in Jordan, Montana. Reed was the administrator of his father’s estate. I have visited his granddaughter Bertha Spracklin Roufley on several occasions and learned a great deal about Reed. 4. Daniel Goss Spracklin was born 21 Sept. 1870 in Benton Co., Iowa and died the 8th of August 1927 in Calhoun Co., Iowa. He married a Susan Matilda Marrow on the 29th of January 1907 in Iowa Co., Iowa. I do not yet know where Daniel is buried. 5. Peter George Spracklin was born the 31st of August 1872 probably Iowa Co. His father Daniel had moved the family from Benton Co. to Iowa County and 20 miles south and it was about this time that he made that move. Peter died on the 26th of January 1956 in Reading, Berks County, Pennsylvania. 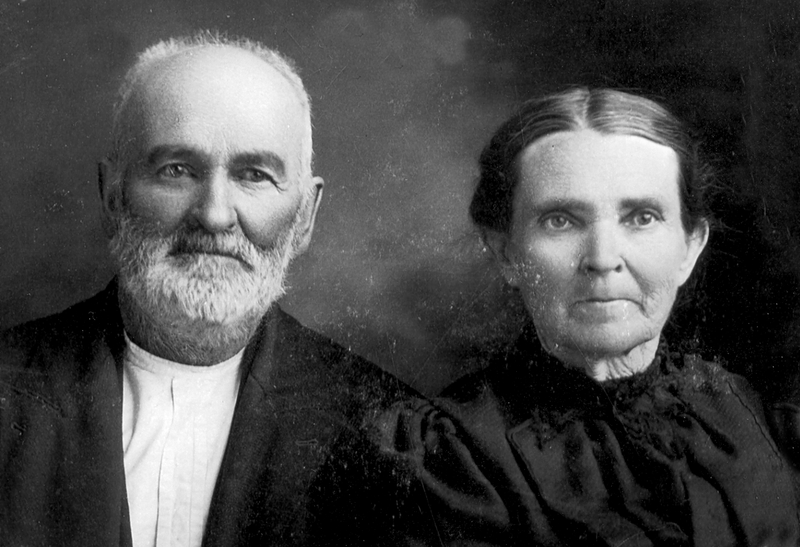 He married Etta Mae Hall on 1 January 1896 in Calhoun Co., Iowa but that marriage didn’t last. Peter has descendants in Pennsylvania and West Virginia and I have had the great fortune to meet them while traveling in Ohio in 2011. 6. Charles Edward Spracklin was born the 19th of September 1874 probably in Iowa County. He died on the 10th of September 1946, Deerfield Township, Cass County, Minnesota and is buried in the Bethlehem Cemetery, McKinley Township, Cass County, Minnesota. He married Arminda Victoria Ward sometime in 1915 in Pine River, Cass County, Minnesota. I have been to the graveside of both Charles and Arminda. 7. Alfred Marion Spracklin was born 16 July 1876 in Iowa County, Iowa and died Dec. 12 1893 in Iowa County. He is buried with his parents in the Community Cemeter east of Millersburg. 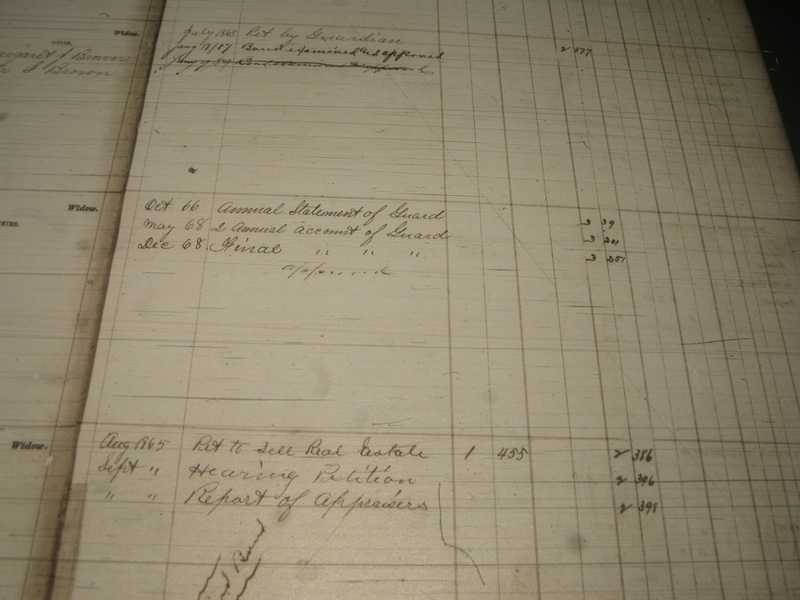 There is some confusion in the published cemetery records of his exact birth date. Some say it was 1899 but I believe it was 1893. More on Alfred in a future post. Each one of the children of Daniel and Sarah and has a great story to tell. One of my biggest problems in tracking the descendants of Daniel and Sarah was that most left and lived in other parts of Iowa or headed for the Dakotas, Minnesota, Oregon, California even some went back to Pennsylvania. By the time of Daniel’s death in 1915 they had scattered. Spracklins are a restless bunch and they don’t like to leave records unless you are willing to dig for them. I pause to give a great deal of credit to my whole and half cousins who have helped me to learn more about each one of these families, the first and the second of Daniel’s. I am grateful for their passion and willingness to share. Of course my interest tends to lean toward the first family so forgive me if I error or fail to present all information. Note: The two photographs were given to me by my cousin Gloria Spracklin Spinler Gloria Stocker Spinler a great granddaughter of Reed Spracklin. She gave me permission to share. Her Aunt Bertha helped to clarify and confirm correctly, who the persons in the photograph were. Reed was her grandfather.